Garam Bheja Fry: A tribute.. 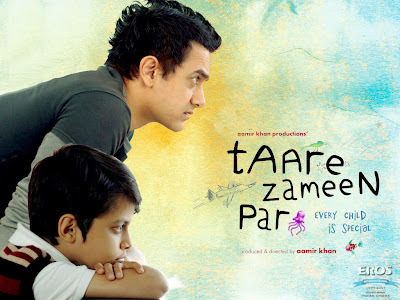 I present before you this song which i wrote as a tribute to this experience named "Taare zameen par". The tune which was playing in my mind while i wrote this song was of "Kholo kholo darwaaje" from the same movie. No humor this time folks. aankhe meenche meenche bhaagi chali aayee dekho !! karvat badal ke dekho, khidki ke bahar aaye saare!! neend ke baadalo ke peeche, chaand kho naa jaaye dekho!! bachpan ke din wo pyaare. jebo me bhar , hatheliyo par. Ye jo hai hawa chaand aur taare. wo jo hai 'taare zameen par'!! " From humour to short stories to now poetry, dude you're right on your way to becoming a media moghul! enjoyed the poem thoroughtly. But i dint really like the movie much..brilliant 45 min story dragged to a 3 hour format..zabardasti. poem to ekdum jhakaas bole to bindass..
Movie was a treat to mind, ears and heart..
Masstt hai ekdum!! Especially the last three paragraphs :) ..And movie ki toh jitni tareef karo kam hai..
ye rog kab laga tujhe?? ?.....accident k baad kya??? an amazing movie..ad na gr8 tribute.. well written abhi!! and hey abhi... umm... mr.asthana, a very happy new yaer to you! Like I said... u're just missing Shaan and A R Rehman..